Watermelon is one of the most satisfying garden crops to grow, but it's not necessarily the easiest. Getting your plants to produce large, tasty fruit involves a little luck and a lot of attention to the unique needs of the plant. Follow this collection of the top tips for growing the best watermelons. 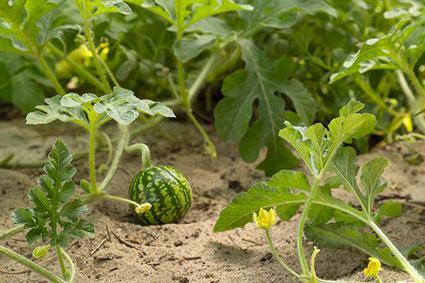 Watermelons need fertile soil and a long, hot growing season to produce good fruit. One of the main reasons the fruit fails to become sweet and mature is because of lack of heat during the ripening period. Watermelons are an annual that can be grown in any zone during summer, but only in USDA zones 4 and warmer is there a long enough growing season for them to produce good quality fruit. Sow seeds indoors 6 to 8 weeks before the average date of last frost to get a head start on the growing season. Transplant the seedlings into 6-inch pots while they're still indoors so they can put on plenty of growth before they are planted in the ground. 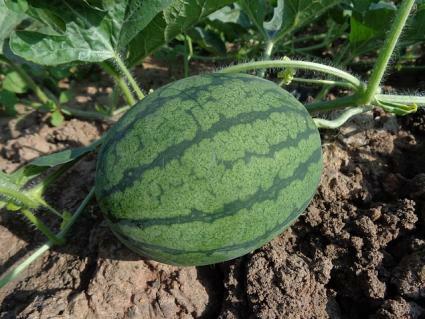 Wait to plant watermelon in the ground until several weeks after the last frost to ensure the soil is sufficiently warm. Only plant watermelons where they will receive at least 8 hours of sun per day. In climates where summers are short and cool, plant watermelon against a south-facing wall for extra warmth. Planting where the watermelon vine can sprawl onto a concrete patio will give it extra warmth. Mix compost with the planting soil at a 1 to 3 ratio and form into hills about 12 inches tall to create the rich, loose soil that watermelons love. Space the hills about 6 feet apart and plant three to four seedlings on each so they have plenty of room to grow. Cover the soil around the seedlings with black plastic -- this holds the heat in, prevents weeds from growing and keeps the fruit from developing soil borne diseases. Insufficient water is one of the primary reasons that watermelon plants fail to thrive. You'll also need to pay attention to pests and disease and may want to do a bit of pruning to encourage optimal fruit production. Watermelons should be watered whenever the top inch of soil dries out -- they may need up to 2 inches of water per week during hot weather. Leave a hose to trickle at the peak of the planting mound to make sure the water actually gets to the roots and doesn't run off. For the sweetest flavor, reduce watering as the fruit gets bigger -- at the very end, the vines can be allowed to dry out to the point where they are slightly wilted. For lush growth, fertilize with a high nitrogen fertilizer up until the flowers and fruit begin to form, such as 10-20-10. After the fruit develops, switch to a high phosphorus fertilizer, such as 20-10-10, to encourage large, healthy fruit. Do not plant watermelons in beds where fusarium wilt or other diseases of the watermelon family have been a problem; this includes diseases of squashes, cucumbers, gourds, and other melons. Avoid watering the leaves of the plant to help prevent foliar disease -- water at ground level only. Inspect the base of the vine regularly for small holes where squash vine borers have tunneled. They are serious pests and often require treatment with insecticides to cure. Mild, not-toxic insecticides, such as insecticidal soap, are sufficient to cure most other watermelon pests, which include aphids and other sucking insects. Watermelons are reliant on bees for pollination, so avoid using pesticides and take steps to attract them; this includes planting flowering herbaceous species nearby, such as clover and lavender. Remove lateral vines that emerge from the main stem to increase the size of the fruit. For the biggest fruit, pinch off most of the flowers to allow only two or three fruits to form per plant. If black plastic mulch is not used, slide a piece of cardboard, a wooden plank, or a handful of straw under the fruit to lift it off the soil -- this keeps the fruit from rotting. Watermelons do not ripen off the vine, so it's important to learn how to pick them at the peak of maturity. Ripe fruit makes a hollow sound when you thump it with a finger. 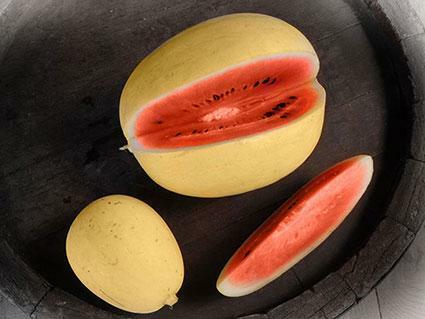 The part of the melon facing the ground turns from white to a cream color when the fruit is ripe. Ripe fruit should give a bit when you press into it. If the vine is fully green, the fruit is probably not fully ripe -- wait to pick it until the vine has started to shrivel up a bit. Use a knife or hand pruners to clip the vine from the stem, leaving a little piece of stem attached. 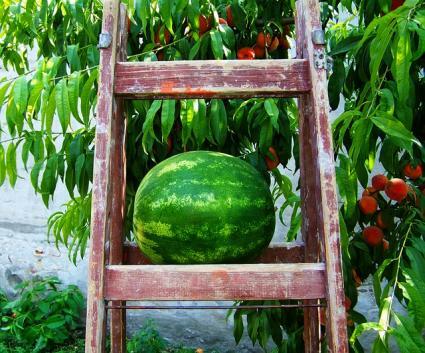 If you've tried growing watermelons before, but haven't had much luck, try some of the time-tested tips mentioned here. With a little extra TLC, you'll have the perfect watermelons you've been dreaming of.